These little snacks are perfect to calm a sweet tooth while still staying healthy. 2. Do the same procedure with your carrots. 3. Mix remaining ingredients in with your carrots and apples. Use your hands and really mash it together! 4. Grab chunks and roll into balls about 1" in diameter. 5. 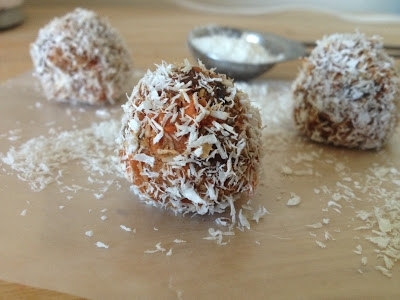 Pour some extra coconut shreds into a small dish, and roll the balls around in it so they are evenly coated. 6. Set on wax paper and stick in your fridge for a few hours to set. 7. Keep refrigerated in an air tight container!